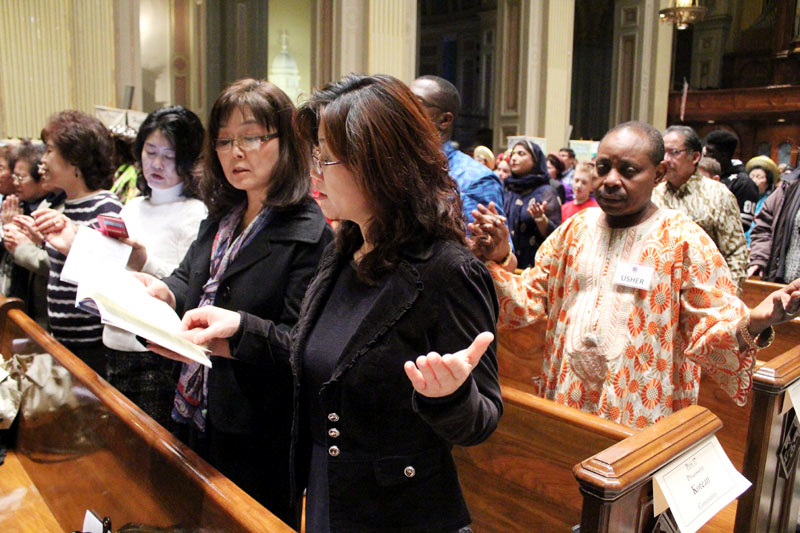 The theme of “One Faith, Many Cultures, One Family” was an apt one for the hundreds of participants from 25 ethnic communities celebrating their diversity and unity in the Archdiocese of Philadelphia at the Cultural Heritage Mass March 14 at the Cathedral Basilica of SS. Peter and Paul. A committee of almost 40 volunteers met, planned and worked diligently for more than three months on the 18th annual Mass, sponsored by the archdiocesan Office for the Pastoral Care of Migrants and Refugees. The hard work paid off in a successful event, as evident in the entrance procession where participants dressed in the attire of their culture and carried banners indicating their family’s country of origin. All the people honored their heritage and showed their unity in the celebration of the Mass. “We have a global church in Philadelphia and so we celebrate who we are when we celebrate a Mass like that,” said Matt Davis, director of the Office for Pastoral Care of Migrants and Refugees. Sister Florence Enechukwu, who serves the African Catholic communities in Philadelphia, had attended the Mass for years but never got involved with its planning until last year. Now she helps to coordinate the seven choirs from throughout the archdiocese that sing in different languages during the Mass. As with so many aspects of the faith, “personal contact” is the key when inviting communities to participate in honoring their ethnic diversity, Davis said. For this year’s Mass, communities representing the Ivory Coast, Cameroon and Maronite Catholics – an ancient Catholic rite based in Lebanon — participated for the first time. The planners of the Mass invite all parishes of the archdiocese to participate and celebrate the Eucharist at next year’s Cultural Heritage Mass. The colorful banners, native cultural dress and the different languages brings a richness that “feels like a glimpse of what we think the Kingdom of God and what heaven will be like,” Davis said. In September, Philadelphia will be hosting the World Meeting of Families where Catholics from all over the globe will come together to celebrate their faith. Catholics in this archdiocese will already know the rich cultural heritage of Catholics from many parts of the world who call Philadelphia home and who celebrate the universality of their faith here.